It's so hard to believe that it it took place 45 years ago! It really doesn't seem that long ago. If I close my eyes and listen carefully I can still hear Janis belting them out while the smell the sweet mixture of cow manure and pot gently scented the air. The 60's was (were) a turbulent decade. The assassination of JFK kept us fixated on the TV for days and gave us an insecurity that other decades had not felt before. Those of us growing into our own during the 60's were also very much affected by the war in Vietnam. We would all watch the "war lotto" to see which of our friends and loved ones would go across the world to fight in a country that we had not even known had existed. For me, like other teens my age, the draft number lottery was especially painful as I had a brother that was just 2 years older than I was and I wasn't ready to let him or my friends leave our safe, secure Long Island town. The 60s was also showing pains from the growing racial issues that faced us all. Segregation, desegregation, marches on Washington and sit-in at our schools. We all needed to become equals. Many families were separated by what has been termed the "generation gap". Parents not knowing what their children were doing and children learning not to trust anyone over 30. There was confusion and mis-trust between the "straight" and the "heads", music was going in directions that most didn't understand. The world was spinning out of control and we were all angry about something. This was Woodstock and our world and lives would be forever changed! All photographs and memorabilia that are from my personal collection may not be reproduced or used without express and written permission. Getting to Woodstock wasn't that hard but getting home was another story. By the time we did arrive home, we were dirty, smelly and covered from head to toe with mud. We had walked (I was barefoot as I had my moccasins - dare I say stolen, when we left our belongings to wander around) for what had seemed to be hours leaving Woodstock to find a bus back to Grand Central so we could take the Long Island Rail Road back home. We got some very strange looks on the rail road and no one would even sit anywhere near us, so we found a car just for us. I guess I don't blame them as we did look & smell quite frightening. 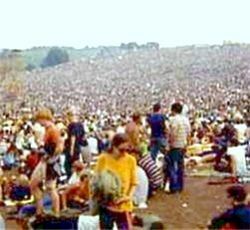 The 1969 Woodstock Music Festival as most are lead to believe, was never held in Woodstock NY. Relive the look & feel of Woodstock through home movies of those who attended. The first few Woodstock videos on this lens fit into this category. Although they don't have the glamor of most of the music videos, I believe that they are just as important as this is...the real Woodstock! Please note that you will leave this page when you view any of the Woodstock videos in this section and also the music videos further down the page, so please remember to return to us after viewing your selected video. Or better yet - bookmark us. Thank you! Although I had brought several rolls of film with me to Woodstock, I only took a handful of photos. At the time, I felt as though it was too "establishment" or "commercial" to capture this moment of time on film. I also decided not to purchase any t-shirts that were on sale for the same reason. Well only about 20% of the photos that I did take came out and what I wouldn't do to have an original Woodstock tee now (one that I got while I was there). 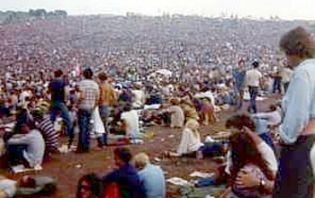 The head count (kind of a pun) for Woodstock ranges from 500,000 to 650,000 depending on who was doing the counting and whether or not they counted those who were stuck in traffic and were turned away. One estimate was even a high (yes, another pun) as 1 million! 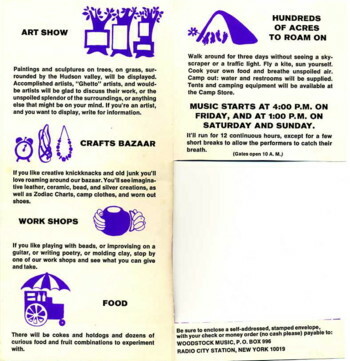 Originally billed as a 2 day arts, crafts & music fair, Woodstock was later changed to a 3 day festival at White Lake (town of Bethel) adding Friday August 15th. Just look at the performers who you would have missed, had it only been a 2 day festival. You also would have missed John Sebastian (who was not scheduled to perform but some of the performers were unable to arrive on time due to the heavy traffic and Route 17 was closed), Bert Sommer and magnificent Melanie who though only sang 2 songs, electrified the stage with Beautiful People. With over 500,000 showing up the New York thruway become a parking lot and Route 17 had to be shut down. Filmmaker Barbara Bedick's home movies from Woodstock. Although Barbara could have added music to this clip, I find that the simple quality of the silence with just the sounds of the the camera really makes this video more insightful. With no music to distract, it captures the simple times of the weekend and the decade. I remember while at Woodstock seeing T-shirts being sold at two different tables, some with the Woodstock logo and some tie-dyed. There may have been more, but these 2 tables in the woods were the only ones that I had noticed. We were so caught up in the moment that we didn't even think of bringing back any type of souvenirs. Just wanting to just enjoy the then and now and not even think of going back home. Well 40 some odd years later and I am still kicking myself. I have over the years amassed a huge collection of commemorative and tribute T-shirts and although they are not original I love them just the same. T's look best when they have that worn look so I don't treat them gentle and I over wash them, get them frayed and make sure that they get a faded look. If you do plan one doing this also be sure to order one size larger as your torture might shrink them. They finally printed out brochures to sell tickets after they changed the concert from 2 days to 3 days. All seemed fine but then they moved Woodstock from Wallkill to White Lake. The tickets came in a smaller envelope to protect them. You'll notice that the price for the tickets are only $6 each. That was the price for advance sale tickets. If you check Ebay you will notice that everyone is selling the $7 or $8 tickets. There are very few of the $6 tickets in circulation and even a smaller number of $6 tickets still in a set. And no, they are not for sale. I even kept the money order that I used to buy our tickets. Who would have known that Woodstock was going to be such a major event? After chanting for rain to cool down the crowd, the sky opened up and it rained, and it rained and it rained. Do you think that technology like cell phones, digital cameras and instant streaming would have made Woodstock less important or special? So How Did Woodstock Get Its Name? At the time when Woodstock was just a glimmer in Michael Lang, Joel Roseman, John Roberts & Artie Kornfeld's eye and they were thinking of a name to call their venture group, they had remembered the quiet but artsy town where Dylan lived in Ulster County NY, called Woodstock. 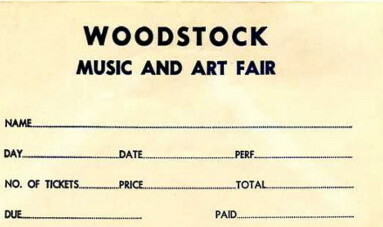 Since they were planning a music & art fair the name seemed to fit right in, plus the reputation of the town of Woodstock as a musician and artist haven would be an added plus for their Aquarian Exposition. They decided to call their corporation Woodstock Ventures Inc. & that my friends is how Woodstock got it's name. John was not scheduled to perform but filled in at the last minute because several performers were stuck in traffic. This video has great shots of the crowd and you will also notice that John is smiling throughout the entire song. Can you not feel the love in this performance - this is the true Woodstock experience. Jeff Beck Group was scheduled to play on Sunday, but a few days before Woodstock, Nicky Hopkins left the band and the rest of the group disbanded. However, Nicky Hopkins did play at Woodstock after all by playing with the Jefferson Airplane. *** Due to the Jefferson Airplane's early morning (4 AM) set, they are often shown as performers for either Saturday or Sunday. The Pied Piper of Woodstock has been one of the most anticipated books in the music industry. In The Pied Piper of Woodstock, Artie walks you though the music scene of the 60's, his unprecedented achievement as the youngest-ever VP at a major record label, and events that led up to his part as the co-creator of the Woodstock Music festival Of 1969. Although many books about Woodstock do delve deeply into the who, why and where of Woodstock, Artie also lets you into his vision of the conception and birth of this legendary festival and how it related to the movement of the times. Only Artie can give you this rare look inside the legendary festival, the music industry and the youth of the Woodstock Nation. Artie, leads you back in history as only Artie can. You won't find a glorified remembrance or one sugar coated, but a true to life "warts and all" look back in time. However, its not just about Woodstock but about the times and events that lead us there. Get to see a backstage look at the music of the times and how events in Artie's life helped to shape music in the 60's and also the music of today. There are times in the book where your heart will be filled with love and triumph and others where your heart will break and you'll feel the tears running down your cheek. You'll find many answers here as well. The answers to questions that we all have asked and only Artie can answer. I am fortunate to have a signed copy with a few lines of inspiration which I immediately boxed. But I do have an additional copy which I keep out and when ever life seems to get tough, I open it up read for a while and it lightens my spirit. Artie has not just documented Woodstock or the music industry but has taken you into his life and his soul and is such an amazing man. Did you know that he is still donating his time and energies to help those who are less fortunate and also to continue to spread the peace movement? He also doesn't profit off of this book or other Woodstock related promotion but donates his profits? Artie - we all love you man! As being one of the contributors to this book, Peace, Music and Memories, by Brad Littleproud and Joanne Hague, I have to tell that you I am so excited to finally see this all come into place. If you get chance check out my Woodstock photo contribution on pages 40, 66, 144 &amp; a recent photo on page 182. It was and still is, so exciting to work with Brad Littleproud. As you can tell by my lens here that Woodstock make an everlasting impression on me and to be able to work with others who also shared the same experiences that I did is totally mind blowing. Then you have Brad and although did not attend Woodstock was mesmerized by what he had read and heard about, set off with Joanne Hague to create the Woodstock Preservation Society which helped to historically preserve the original Woodstock site. Brad is still faithfully working and keeping the memories alive. "Woodstock: Peace, Music &amp; Memories" tells the story of this society-changing event, in the words and photos of the people who were there. The book, with its natural and recycled look and mix of 350 color, sepia and black and white photos, plus interviews with performers Carlos Santana, Canned Heat and Mountain, invites readers to journey back to three days of peace and music. This video gives you a bit more insight into the book "Woodstock 40th Anniversary Tribute - Woodstock: Peace, Music & Memories" that is shown right about this video. This book is very emotional for me as I was able to contribute photos and memories of Woodstock. Brad & Joanne have done an excellent job of creating a book that takes you inside Woodstock and lets you see it through the eyes of those who were there. As a Woodstock fanatic I have been waiting for many years for this Woodstock 40th collection to be released. However, this collection exceeded my expectations. With the additional footage and interviews added you'll see several hours of Woodstock you've probably never seen or heard before. All I can say is that it's totally cool! Woodstock Blu-ray - It's also available in DVD format. The limited and numbered Amazon Exclusive 3-Disc Ultimate Collector's Edition features more than three hours of extras two hours of rare performance footage and it also has a another hour with short interviews and insights from Martin Scorsese, Director Michael Wadleigh, and Producer Michael Lang. Some may think that the fringed box jacket is a little silly, however I liked the added touch and it seemed to create the right atmosphere for what is inside. Could be due to the fact that I had owned a fringed jacket during the 60's but I really like it. While I found a great video interview of Michael on Youtube that video has now been removed from their line up. I'll continue to look for another great video to show you but until then here are a few places to get more info on Michael. would also like to thank the many sites that are linking to this page and listing it as a top Woodstock resource page! Iwas one of the lucky ones who went to Woodstock (and remember most of it :-) ), and it's an experience that has changed my life for the better. Even almost 40 years later I still can hear the music and get that peaceful feeling every time I smell cow manure (if you were there you'd understand that statement). If you had any special moments or if Woodstock had a life lasting effect on you too, please share them. And if you didn't make it to Woodstock do you think that you would have gone? Remember it was advertised mainly as an art fair and only as the date approached was the music the main focus. We have added a new guest book right below this and would like to know if you had a chance to attend any of the Woodstock 40th reunions. Do you think that there should be a 40th Woodstock reunion festival? Have you ever noticed that in many Woodstock photos you see many orange tents? 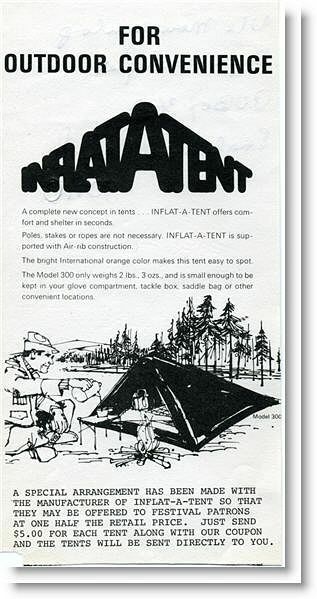 Well for those of us who pre-ordered our tickets by mail we also had the option of purchasing an inflatable tent for $5 and many like me took advantage of the offer. 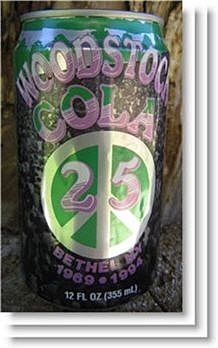 Although I wasn't able to make it for the 25th Anniversary, I was able to score an unopened cola can. I thought that the design on the can was kind of fitting for the 25th. I hope that you have enjoyed this little piece of the past. For me it is a true labor of love and social sharing. Please bookmark and stop back again as you'll never know what we'll add next. If you haven't already, please leave a comment in my guest book. 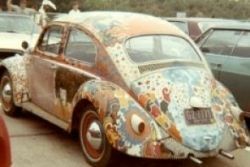 The photograph of the VW Beetle pictured at the right was not taken at Woodstock but was taken a few days before the festival. Pretty cool paint job, don't you think? All of the photos and scanned memorabilia (with the exception of those with hyperlinks) are all part of my personal collection. This page is dedicated to my Mom, who was not only nice enough to allow my brother and I to go to Woodstock (and who saved tons of newspaper clippings about Woodstock while I was there) but who also taught my brother and I to always be true to ourselves. There were two main 40th reunions - the 40th at the original site at Bethel and West-Fest in California. There were also a host of reunions worldwide. We would like to know if you were lucky enough to attend any of these reunions and what your experience was. 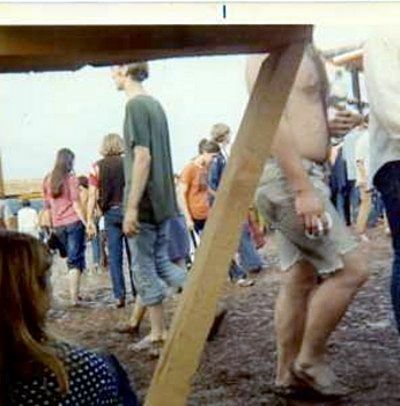 Do you have any special Woodstock 1969 Music Festival memories? If so please share them! Happy, healthy new years to you Nebby. Hope this message finds you. If the timing is right and the musicians are worth traveling for, or maybe if I know you're going for sure, I'll do my best to attend the festivities this August at the 50th anniversary of that infamous weekend. My son said he's willin'. I CAN"T BELIEVE IT STARTS TOMORROW. Had I known, I would have found a way, but unfortunately we both have commitments this weekend. Anyways, last weekend was most enjoyable. Camped at nearby Swan Lake Camplands which is only minutes away from Bethel Woods. Three quarters of the people camping go to the concerts so there's always a party atmosphere for the entire weekend. My son, quite the excellent guitar player, probably played with at least half a dozen different people throughout the campgrounds. Whenever he wasn't eating, he'd just roam around the grounds with guitar in hand and settle in somewhere for a several hours to play with others or by himself. I, like your husband, used to play in HS and College but only dabble now. The concert itself was excellent, I mean up there with the most notable, until about 80% through and then he began to stress his campaign regarding the bioengineering of current farm products which is the theme of his latest album. Monsanto this, Monsanto that. It was a little too much. Other than that he was superb. At about 1/3 the way through he suggest that all of the Woodstock veterans take sledgehammers and tear down the Bethel woods pavilion so the concert goers could get closer to his performance. I don't think so. HL, I'd find this website wherever it goes. One of my favorite and I'm always referring to it when someone puts up a reference to Woodstock in Facebook or elsewhere on the web. Not to fear. I enjoy my annual synopsis of the concerts attended but I fear there was not too much activity since last year. Hope I wasn't too dominating, turning people off. When our pages got moved, the first thing that I thought of was whether you would be able to find it. Seeing that you have has totally made my day :) Have you or him ever had the chance to go to the Newport Folk Festival? I bet you both would really enjoy it. With the 50th anniversary there may be a resurgence. Are either you or your son into playing what you listen to or more into just listening? My husband was in a band (guitar) during his HS and Navy years and occasionally plays but just fools around now. Can't wait to hear about your latest adventure. Keeping the tradition alive. Friday night Neil Young is playing at Bethel Woods and as before, my son and I are making a weekend camping trip out of it. It's been a annual tradition up to now, I wonder how long we can keep it going. 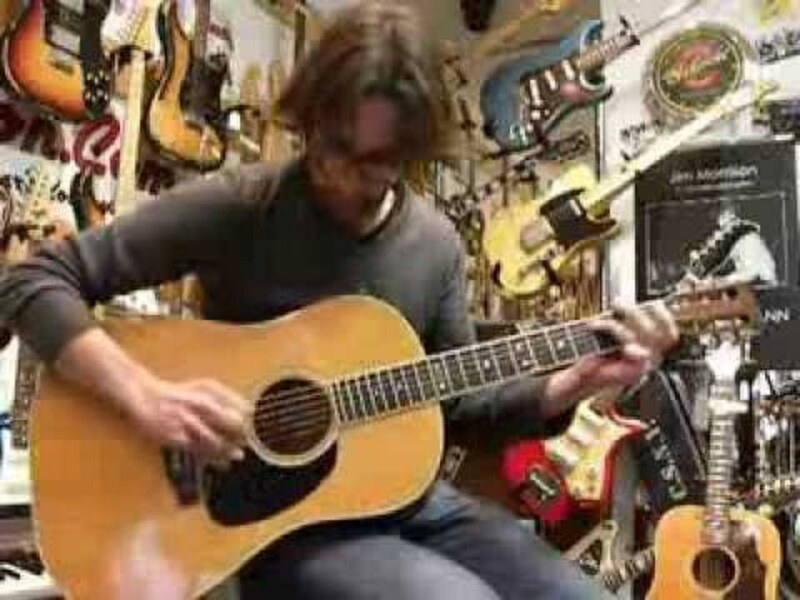 He's an avid folk guitarist and the past three years it's gone from the Eagles to CSN to Neil Young this year. We've seen our share of R&R concerts mixed in here around the city, but I think he's focusing on predominately Folk at this point in time. I'm pretty lucky considering what other 19 y.o. are listening to. I will give you a report when we return next week. Probably my favorite lens! The music of that time was just amazing. @michelliot: Is it almost that time again? The time is just going much too quickly. I know that I have said this before but I am so envious of you being to keep the flame alive, rekindle it year after year and to introduce it to another generation through your trips with your son. Yes, I probably would have gone if I had been old enough. There aren't many times in life when we just abandon our comfort zones and really open up to life. This was obviously one of them. Such a great read! Thank you so much! What a fun read, thanks! Arriving in a long velvet maxi dress and stepping into mud! But I loved the festival anyway, we were there 2 days! Wonderful lens. Thank you for sharing your memories and pictures. I was in collage when Woodstock happened but I really really wanted to go. I have watched the Woodstock documentaries so many times that I know them by heart. Your lens is AWESOME! Thank you for all the work you put into this amazing documentary! Thank you for sharing your memories..
Great lens about a wonderful experience. An awful lot to read here I will have to revisit this lens. 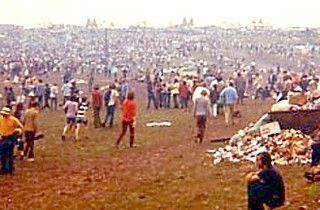 Of course, "If you remember the '60s, you weren't there..."
Not to be a wet blanket...but I am ambivalent about Woodstock...and about one of the concerts it spawned the following summer, the Goose Lake International Music Festival held near Jackson, MI. I wasn't at Woodstock, but did spend 2 1/2 days (or should I say, "daze?") at the Michigan venue. In fact, I am ambivalent about the 1960's. Great music...and I must admit, I did enjoy some of the other aspects of the sixties, as well. But I think too many folks who spent their adolescence in that decade brought their adolescence with them right into new millenium. The real helluvit is, some of them are in DC running the government. Great Lens. I was born 2 days after Woodstock! Fabulous lens. I was just 12. The crowd seems a bit much, but the bands and music that festival promoted made our world a better place and I'm glad for that. What intriguing memories in words and pictures!! I was married, working, and too compulsive to spend three days in the mud without a bath in 1969, but loved reading about Woodstock. Awesome lens, I did not know Woodstock was forced to move, but then again I know very little of Woodstock. Awesome Lens! Fantastic lens! This makes me want to go back in time! Too young to have been there, but for many a turning point in history, I understand. Lovely lens, enjoyed the clips. Your lens is quite amazing! Very factual information and tons of useful videos. Bravo! Excellent lens! Thank you for sharing your memories and feelings. This is an incredible article you have and what memories! I was only a toddler when this event took place, but thanks to your amazing research and personal experiences I can enjoy a slice of it here! Thank you for creating this wonderful lens! I definitely think that cell phones with video recorders would have taken away from the mystique of Woodstock. Wow! Pretty exhaustive and definitely interesting look at Woodstock. I was only 14 at the time. So i was too young to really take in and understand all that was happening then but I surely remember the highly charged atmosphere. The Huntley-Brinkley Report was on every night with news of the war and social unrest. I remember wondering why all the fuss all the time. My biggest regret is being too young to appreciate Hendrix before he died. What an absolutely amazing lens! I've got goosebumps now! If I ever got the chance go back in time I would choose to go to Woodstock. Excellent work! @nebby: Very Cool HL, I spent my teens and 20's in Woodmere, just a stone's throw compared to now. @michelliot: It is always so nice to hear you talk about your adventures. There is a unique way that you write, weaving layer over layer, almost like a spider weaving a web and it's easy to get lost in your vision. Hicksville? Yeah know it well - well at least I did - it's where I spent my teens and early 20's. Haven't been back there since visiting in the early '90's. 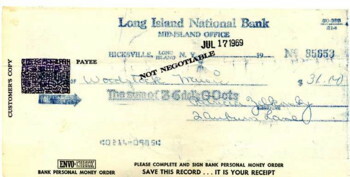 @michelliot: Bye the way HL, is Hicksville meaningful to you? @JimmPlus: just a note James, my son, now 17 years of age, relates to that era, just as much, if not more than some of my 60+ y.o. friends. He's a rock historian dedicated to the knowledge of the artists as well as the music of the woodstock age. I was very involved with the music at the time, and he still knows more of the who's who in the era then I do, no pun intended. He's serious enough that I think he's one of those who will prevent this genre from fading before it should. He's also a well schooled guitarist who will be able to bridge the generation gap musically and carry the woodstock era beyond our years. If i could go back in time this is where I would end up! Excellent documentation. Thank you for publishing this lens. Had the privilege of heading back to Bethel and attending the Eagles concert with my son last week. We actually went camping for a few days at a near bye site which made the experience that much more meaningful. The campgrounds were filled with concert goers but less then a handful who attended the original concert 44 years ago. What I DID especially enjoy, was talking to the owners of the grounds and some other locals who were around back then. The traffic jams were the main reflection they commented upon, but also mentioned were the concerns of health issues, feeding and emergency care for the concert goers. Shows me that they were putting their own lifestyle disruptions on the back burner. Naturally, we visited the original site but then entered the grounds leading to the concert pavilion itself. Stunningly well manicure with food tents and souvenir stands, but spread out, without the in your face feeling. This, along with the painting-like vistas, made the experience much more enjoyable than expected. The pavilion is an open sided pie shaped structure on an steep angle without a bad seat in the house. Behind that, is a lawn section which probably seats thousands more. No chairs allowed that might block others, only blankets. I believe normally, capacity is 15,000, but for this show closer to 17,000 were admitted so I was told. Next day went to the museum which did an excellent job depicting the original show via pictures, videos, and physical artifacts from the event. Definitely, worth a visit to reminisce. All in all an awesome few days, with my son, incorporating the music of the era, camping in the small town of Bethel, NY and befriending a few locals as well, what more can one ask for. Whenever I've headed back there, it's truly spiritual as well as emotional. Great lens. I would have loved to see Credence, Three Dog Night and Jimi Hendrix. Great Lens, A lot of real good information on Woodstock 1969. I was just a kid living in the middle of the country but I remember the National News talking about it and the photos they showed. I would have loved to go I remember listening to a lot of the performers that were there. Although I was living in Africa we were there if not in body but most certainly in mind. Love this lens! Terrific! And it was on my birthday, although I was too young to enjoy it! Some of ky favorite artists! I was in an orphanage in August of 1969 when I ran away and started hitch hiking. It was the very first time I ever hitch hiked and I was scared to death at first as I was only 14 years old at the time. These 4 young women picked me up and asked me if I wanted to go to Woodstock. I had no idea what they were talking about. They told me that it was a concert that would last for 3 days and 3 nights. I told them that I didn't have any money, but they took care of me. They even had extra tickets, which we didn't need anyway. It was utter chaos when we got there. There was excitement in the air. I'm probably the only 14 year old boy that went in as a virgin and came out as one. Those women promised that they would look after me and protect me and they kept their word. Maybe a little too much. But I loved the music, hated the rain, the mud, the mess, but I've never had such fantastic company before or since that weekend. It took them until August 31 just to get me to Dulles Airport outside Washington to put me on a United Airlines DC-8 bound for Denver, which they paid for and that was the last I ever saw of them. I know their names, but will never reveal them. Dulles Airport is in Virginia, and they could be arrested even today for violating the Mann Act. In Virginia, there's no statute of limitations on any crime, if the information I have is correct. I'm not willing to put any of them in any kind of danger of being charged with a crime, that, in my opinion, was never committed. I forget what movie it came from but the quote, which I'll never forget, was this: "Where there is power, there is no love, and where there's love, there's no need for power." It was the only time in my life that I really felt real love from everyone 24/7. It was a natural high that I so long to repeat, but probably never will. Thank you for this page. What you have done is stir up some very good memories in my heart, in my mind, and in my spirit. Was driving back from Rochester to the city this weekend and decided to take 17 so I could show my daughter the site. Arrived late in the afternoon as the museum was closing, so we just went to the monument overlook to show her the actual stage and hillside area. Always a pleasure to awaken those memories. When we got to the monument, we saw two people just sitting in the area what would have been just in front of the stage. Maybe, they were two participants from the event reminiscing how wonderful the concert was or perhaps they were to people who just came out of the museum trying to imagine what it would have been like to be there. Shows how spiritual this place really is. Looking forward to be back here in July. I love to remember those days. Seeing real hippies! Fab lens -love it. I didn't go, but your lens brought back so many memories. Thanks! Blessed. @nebby: My son and I saw the Who a couple of times on their Quadrophenia tour recently and Daltry doing the entire Tommy last year. No real loss in vocals there. I think Townshend's voice actually improved from a couple of years back. I agree that several stars, at times, seem to talk their way through songs but that's ok. Actually, I watched the Sandy concert again the other day and the good majority of the old timers (sorry), were spot on vocally, and in pretty good shape to boot. @nebby: Why thank you HL, I appreciate your appreciation. I just referenced this site to my high school class ('68) on facebook after someone paid homage to Richie Havens at Woodstock. Received several positive responses already. How can you not? THE ROCKY MOUNTAINS! I don't know if I'd be homesick living there. One of my favorite locations on this globe is the range between Banff and Jasper in the Canadian Rockies. Been there a couple of time and hated to part. Every year I look forward to your posting and wonder or not you have forgotten about us or not - so glad you never do! As soon as the weather starts to warm up a bit I start to get homesick for the east coast ( I'm in the Rocky Mountains now), then I see your postings and feel like I go home just for a short bit. @michelliot: PS...G-d bless you Richie, it was you set the scene for the rest of that monumental weekend. Thank you for the many years you gave entertained us with your unique music and style. All of our beloved talent up there can now jam with someone truly special. Morning Health Lady et al. Only people who were born in the 50s and 60s can relate to music of that generation. Fortunately for me, I was part of this period when music is simply beautiful and evergreen. I remember 1969 very well because that was the year I graduated from high school. Long hair, the Beatles and Woodstock were icons of the times. Thanks for the memories. @Girlwiththorns: Thank you! I was very lucky to have gone and do cherish the few short days that I was there. @Fridayonmymind LM: Over the last few years we have been noticing that a few of the older singers have lost a bit of their voice. When the first song begins you start to cringe but after the first line or two that all seems to disappear and the magic begins. By the end of the concert you can't wait to see them again. Like with the Who. The first concert that I saw then was in 67 and my most recent was 2007 or '08 and I'd see them again in 2027 if they play. Who would have thought that we'd still be seeing the same bands some 40 years later. Great personal perspective on a legendary event from someone who was actually there... Awesome! What a blast from the past. I was on the other side of the world but Woodstock news even made it to our neck of the woods. Funny how I am still going to see some of those performers. @pauly99 lm: I wish I had seen Jimi also, but I had to start the trek back so that I could get to work on Monday morning. I do feel very lucky to have gone to Woodstock and when you go to that special place in your head to relax ( you know when you're stressed and they say close your eyes and think of a place where you feel calm and relaxed) that's often where i go. I didn't realize that you and I are so close in age. When Tom talks about how active you are I was always under the impression that you were about 10+ years younger than Tom &amp; I. BTW, congrats on your new job! Pat- awesome lens into the past. I'd just turned 15 that summer, in Ohio... would have if I could have. Tried to talk my older brother into going, but... wasn't to be. Made it to Watkins Glen 4 years later, but those that I met there that had been at Woodstock said it wasn't the same, good as it was. Thanks again, Pat. Great website. Talk about a complete lens. Wish I would have seen Jimmy Hendrix. Here is an appeal for the "Squidoo user" who runs this page to email or Facebook me. I was a toddler when the music festival happened. My parents didn't go. My dad was Air Force and we always lived in Delaware or Maryland. But I have a magazine clipping to share. I have a report in the May 20, 1970 edition of Variety, the show business trade paper, saying the Woodstock movie was doing very well in cinemas in Chicago and San Francisco. My unique comment that I make in Woodstock conversations has to do with that movie released in 1970. Younger generations might not realize how awesome the movie was for people who lived too far away from Bethel, New York to attend. Imagine how mesmerized people were in cinemas in Chicago and San Francisco. Could the person who runs this Squidoo blog please Facebook or email me so I can share a Jpeg of the 1970 Variety clipping? entersignin@yahoo.com Thanking you in advance. Google won't lead you to it. In order to see it you need either me or possibly your local public library, depending on where you live. Have always been sorry I missed Woodstock, and your right it will never happen again. @jodiemaymusic: Music will always be the thread that holds us all together. Each generation brings a new type of music, very different from the last and all reflect the culture of the time. I also know several musicians that have given up. In the past you needed talent and luck while today you need, talent, luck and money. Having to front everything now is what is keeping many good musicians out. They just don't have the upfront cash and if they do, it's gone before they know it and the record industry just doesn't take chances like they use to. That's such a shame. @anonymous: If you wanted to be there - you were - whether physically or spiritually. Sounds like you truly were there. @Cam Marotta: Wish you could have been there. @JoshK47: Thank you! The lens made basically itself. @rwhite10: It would be nice if that gentler time returned. @David Stone1: Dave, I'm a big fan of your lenses and know that the spirit was with you and still is. Either you got it or you didn't - you got! @Wednesday-Elf: Just being around at the time let you enjoy the electricity of the era and although you couldn't attend you still were a part of the movement. @Michael Oksa: I have always felt very lucky to have attended Woodstock. Although I don't think that there will eve be one quite like it, every year I hope that another concert can have its impact on today's culture. Thank you so much for the cool lens! Lots of great stuff here. I used to dream about attending, but I wasn't quite one-year old at the time. I'm a fan of all things rock and roll, and the original Woodstock would have been awesome to experience. My memories of it may be vicarious, but they are still enjoyable. Very nice! I would have been 12. This is the most info I have seen on Woodstock in one place! I missed out on Woodstock ... and most of the 'Times of the 60s'. By 1969 I was married with two kids and one on the way! But I remember the music and the performers of that time and envy you this experience. You did a wonderful job telling your story here. Only 11 in 1969, but the music is now on my iPod (after album, Walkman, skipped CDs). I watched the documentary every year during PBS fund drive. Two of my favorite things, after the music, are the Port-o-Potty worker, who's son was serving in Vietnam, and he still gave high praise to the kids at Woodstock ... that is awesome ... and the utter lack of any commercial brands or logos cluttering up the stage or clothes or anything else. 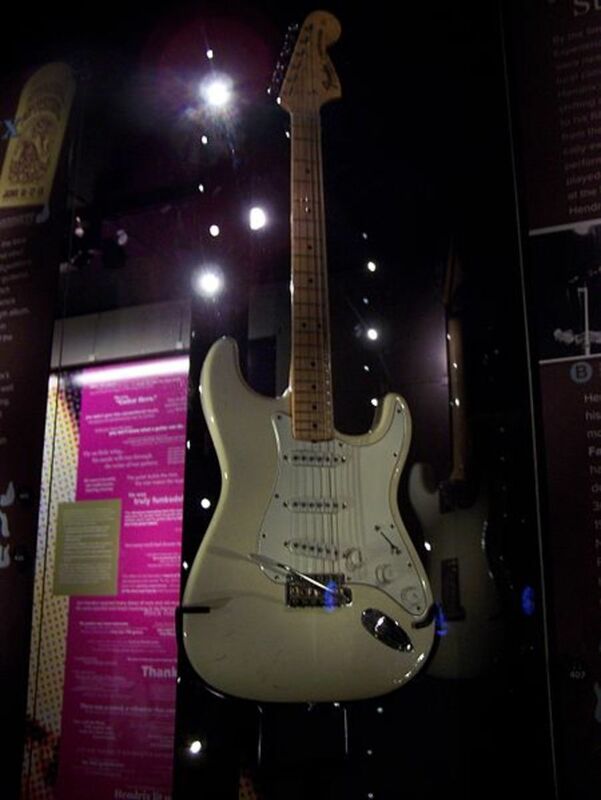 It was a pure moment of American culture and music magic. Kudos to your mom for letting you go. All I can share is missing it by several hundred miles. I had to work, but I also never visualized anything this big. I truly enjoyed your lens. It brought back memories from a kinder and gentile time. 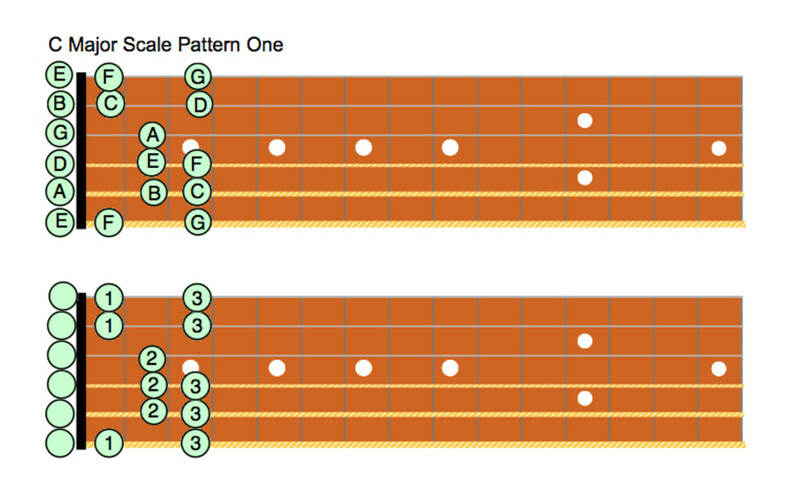 WOW, this is fascinating. I never came across a lens that goes into so much details. Love the silent video footage. I wish I was there. Thanks for sharing such a creative lens. What a phenomenal amount of info you've got on here! Really, really interesting and very well put together. Thank you! Since I was only 14, and living on the west coast, I did not make it to Woodstock. I did have the opportunity to see many of the performers who played there though. I saw Country Joe at a festival a couple of years ago, he's apparently trying to set a record for the call and response "what's that spell?"